We found that early morning is not the best time for photographing Oia, the position of the sun created harsh shadows so the colors will be much deeper and darker; best timing is the afternoon from noon to 3 ish. So instead of going back to our house to get our tripod, we had our morning walk to all the places where we had our wedding photos taken four years ago. We walked south toward the other tip of the village, stopping here and there for photos of course. Although not the ideal time for its colors but no strangers in our photos. The whites were just unbelievable, love the simplicity of the whites and blues of Greek islands! I heard a story that back then when the Greek islands conquered by the Turks, the locals wanted to show their loyalty to Greece so they painted their houses white and blue (colors of the Greece flag). The combination gives a very relaxing and peaceful atmosphere, perfect holiday destination to refresh our minds from our busy work life! The curvy white stairways down to more hotels! Can’t resist to take more photos! Here is the view of the village of Oia! We remembered we had a wedding picture taken here four years ago, it wasn’t a hotel back then! Here’s the gate that we had our wedding photo taken! Right next to the gate is the entrance to Captain John, which I don’t think was there four years ago. More photos with the picturesque village! It was almost 10 already, time flew by when having fun and we still haven’t have our breakfast yet!!! We walked back and planned to stop by a bakery to get some pastry and bring back to our hotel as breakfast. On our way back, there were groups and groups of cruise ship passengers here already! Yes we were hungry but still have to stop for few photos! What is she thinking??? If afraid of the sun, should come here during winter months instead LOL! It was already hot by 10 so I can’t imagine wearing long sleeves and long pants plus that hat! This is the book store in Oia; the cat always sleep in that suitcase, cute! Colors of Oia during mid-afternoon! Time to venture out again for lunch, we picked the restaurant on the top right of our house, this restaurant is always crowded from day to night called Lotzo. We were lucky there wasn’t a long line and we got seated right away. There are few tables with the view of the sea but those are for 4 people. The restaurant has two waitresses, not sure if they are daughter and mother. I heard the young girl said the restaurant was from her grandparents and her dad met her mom while vacationing in Santorini! She grew up here and now she’s away for college, but she comes back every summer to help out! Soup of the day: fish soup, it was very flavorful! Yummy! It was big enough for two of us! Hubby ordered the grilled king prawns with rice; the shrimps were excellent! I ordered a traditional Greek dish called moussaka, it’s like a lasagna but layered with grounded beef and egg plant and cheese. It was my first time trying this dish, it’s good but a little bit heavy side for me because I am not use to having a lot of cheese. We waited a long time for our bill because the two ladies were very very busy; customers keep coming in! The total for our lunch: 37 euros with a Fanta. More incredible views of Oia, just too beautiful! Even though it was our 2nd time back, it gave us a lot of surprises! I think I’ll never get tired of the view in Santorini! Tripod set…here’s a picture of us in our favorite place in the world! We headed the way to the blue-domed church and passed by many and many post card perfect locations! 4 years ago, there weren’t ropes and wall to block people from climbing on the roof, now those two bells are part of a hotel! But there were still a lot of people standing the way to the entrance of the hotel for photos. However, there is a pink roof that has plenty of spaces to setup the tripod for photos 🙂 Thank you whoever own that terrace! We waited for our turn and had the place for like few minutes before others arrived. Ready, camera, action…snap snap snap!!! Never ever tired of this view! Times up! We packed our gears and continued walking south toward the playground, I heard there’s a very cute spot there perfect for photos! We passed by a shop and saw this LOL! Here’s the cute spot right next to the playground! Not crowded at all so perfect for photos…might get crowded after people read my blog LOL! The playground, childhood memories haha! After the rest and shower, we went back out to Oia Castle; we had a reservation at Kastro at 7 pm that I reserved three months ago! It was not time yet so we walked around for MORE PHOTOS! We walked all the way to the windmill and back and it was only 6:30 pm. We felt we can’t possibly ate there for 2 hours waiting for the sunset and hogging the table for that long. It turned out the restaurant already expected people to sit there for hours waiting for the sunset and they accommodate that very well by slowly coming out with dishes. As I mentioned before, the restaurant is fully booked months ahead because of its sunset view and the quality of the food and reasonable prices considering the location and quality!!! I booked three months in advanced and asked for a table on the front view for an unobstructed view of the sunset and we got it! I was so glad that I booked months ahead because there were constantly people coming in to ask and the waiter said: sorry we are fully booked!!! Hubby ordered a glass of wine for him (I can’t drink) to celebrate the romantic view. What was interesting other than the sunset was watching the area filled with people! There were people who standing on the road in front of the restaurant and within minutes, the waiter will have to ask the people to move and don’t block the view of their customers 🙂 Throughout the night, the waiter had to constantly asking people to move haha! Appetizer, we ordered the steamed mussels, it was cooked just right! The castle area already filled! After the appetizer, the main courses came out at least half an hour later, they timed perfectly for the sunset 🙂 I ordered the grilled steak, it was absolutely perfect! This was the best steak I had in Greece. I had a perception that the quality of steak aren’t as good in Greece (and expensive) so I tried to avoid that. But this was excellent quality meat and deliciously girlled! Hubby ordered the grilled lamp chop, he said it was excellent! I like their mash potatoes! Watching the sun slowly set while having our delicious dinner, it was definitely an enjoying moment! It got very windy and cold at night so don’t forgot to bring a sweater or cardigan!!!! The total price of the perfect dinner with view: 68.4 euros with one glass of wine, absolutely reasonable!! We highly recommended Kastro! The shops were all lit up, another different atmosphere of Oia, love it there! All night pictures below were handheld; we didn’t bought the tripod out with us. The tiramisu was good and the Kataifi, first time we had it, was VERY VERY sweet. We just ate the shredded wheat and nuts on the tops, the ones that were soaked in syrup was just too sweet for us! Good night Santorini, we had a great time once again! Our room at night, I turned it to light purple, my favorite color! You are my photography idol! Those pictures are gorgeous. Also, this is a very girly thing to notice, but I love your photo taking wardrobe! The way you coordinate your dresses to the scenery is great! I’ll have to do that when we visit santorini in September for our 10th anniversary. 🙂 we honeymooned there (and Mykonos, hydra and the Amalie coast), but I never found the blue domed church you have pictured here. How do we find it in oia? We are staying at katikies. That wad supposed to be Amalfi Coast! I’d love to see you photograph Positano and Ravello. You should put that trip on your list! Hi I love your blog your pictures are wonderful. Our family will be going to Santorini in one week and I would like to take a picture of the famous blue domed church.Please can you tell me how to get there because I dream of taking a picture their?Many thanks for your help. 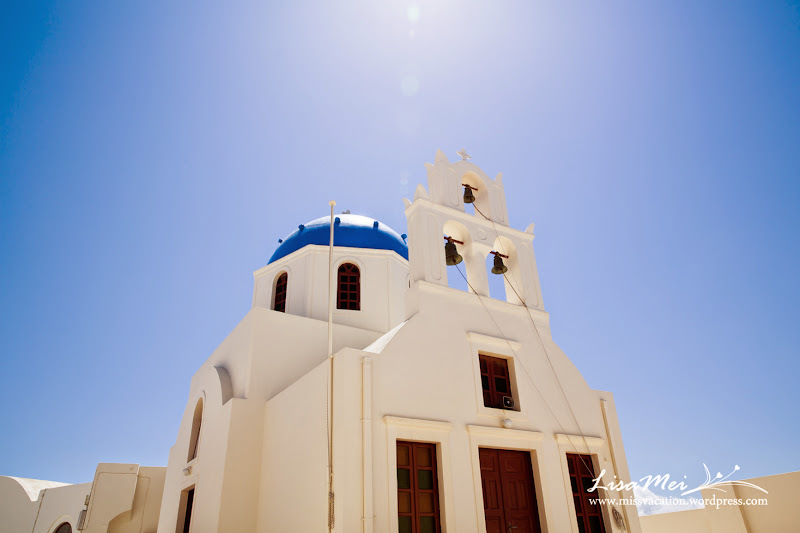 The famous blue domed church is located in Oia, Santorini…it’s a popular village so you can’t miss it! Once you are in Oia, there’s only one main road and a big square where there’s a big blue domed church…continue walking pass the square and there’ll be little roads on your left. Walk down on those small paths then turn right, you’ll see the postcard perfect blue domed church! Where can we find the pink rooftop? Your pictures look so wonderful! Great thank you! And by the blue some church are you speaking of the one with the 6 bells? Hi! Your blog is very helpful. I would like to ask on how to book for a reservation online on Kastro Oia Restaurant? You can email them, their email address is in their website: https://kastro-oia.gr/reservations/ Enjoy the sunset dinner! Previous Post Finally made it back after 4 years….Santorini! Next Post Oia, I Miss You Already!